Beecham House is abuzz. The rumor circling the halls is that the home for retired musicians is soon to play host to a new resident. Word is, it's a star. For Reginald Paget (Tom Courtenay), Wilfred Bond (Billy Connolly) and Cecily Robson (Pauline Col... show all lins) this sort of talk is par for the course at the gossipy home. But they're in for a special shock when the new arrival turns out to be none other than their former singing partner, Jean Horton (Maggie Smith). Her subsequent career as a star soloist, and the ego that accompanied it, split up their long friendship and ended her marriage to Reggie, who takes the news of her arrival particularly hard. Can the passage of time heal old wounds? And will the famous quartet be able to patch up their differences in time for Beecham House's gala concert? 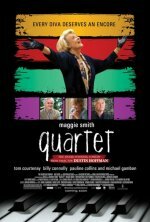 The Weinstein Company is negotiating to acquire U.S. and Latin America distribution rights to Quartet, the Dustin Hoffman-directed comedy that stars Maggie Smith, Billy Connolly, Michael Gambon and Pauline Collins. The script was written by Ronald Harwood. The deal is upwards of $3 million, I’m hearing. added the tagline: "It's never too late to change your tune"